Create a completely custom-built Yahoo! Store / Merchant Solutions template in 24 hours! This e-book shows you how to replace the built-in Yahoo! Store templates with your custom-built design. A step-by-step, generic approach that requires little previous RTML experience (but some RTML experience is required. Q: I already have Deconstructing Y-Times. Do I still need Custom Templates NOW? A: If you have read Deconstructing Y-Times, you probably won't need this e-book. Deconstructing Y-Times shows you how to use RTML to build a custom template from scratch and if you understood that e-book, you probably know more than what Custom Templates NOW! offers. 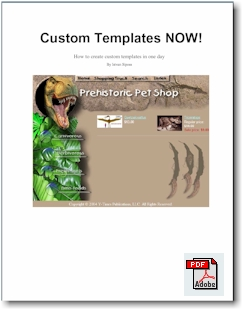 Custom Templates Now! takes a more generic approach towards building custom templates; Deconstructing Y-Times is more specific in that it shows how this particular Yahoo! Store was built. In addition, Deconstructing Y-Times includes some common features such as best sellers, breadcrumbs, etc. Q: What are the prerequisites for Custom Templates Now? A: To get the most out of this e-book, you should know how to use the Yahoo! Store editor; you should have a good understanding of HTML; you should have a good idea about what you want your store to look like; and you should know something about modifying templates. If you need RTML foundation, we recommend RTML 101: The Unofficial Guide to Yahoo Store Templates, or RTML for Yahoo Stores, or go to http://www.monitus.com/rtml-video.htm for a brief tutorial. Q: Can this really be done in 24 hours? A: For the most part, yes. However, individual results may vary depending on your background and previous experience. Whether or not you can create your template in one day depends on a number of factors: your prior knowledge of Yahoo! Stores, whether or not you have your proposed design ready, whether you have at least tried the template editor, and of course, how much time you have to read this book. So, if your design is ready (the one you would like to set up for your store), you know how to edit RTML templates, and you have the time to do this, then yes, you should be able to go through this book and have your custom template done in a day. Q: Where can I go for help if I get stuck? A: Yahoo! provides no assistance with RTML or custom templates. If you need help with RTML or with Yahoo! Stores in general, our recommendation is that you visit the Yahoo Store Users Forum at www.ystoreforums.com. WE ENCOURAGE YOU to look at the table of contents and the introductory chapter (both included here) to help you judge whether this e-book is for you. This is not an introduction to RTML or Yahoo! Store templates. If you are interested in learning about RTML, we recommend you purchase RTML for Yahoo! Store, or RTML 101: The Unofficial Guide to Yahoo! Store Templates. Available in Adobe Acrobat (PDF) format. Download size 1.63 megabytes. This e-book requires the Adobe Acrobat Reader available free of charge at www.acrobat.com.